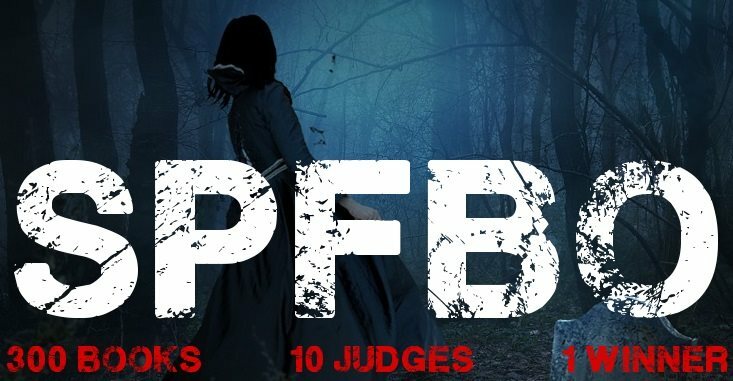 Carrying on from our open letter last week, we SPFBO finalists are taking a day each to talk about SPFBO and to highlight some of our favourite books amongst those that were cut in earlier stages. Cut they might have been, but there’s still a wealth of fantastic stories that might just not have been to their particular reviewer’s taste or were just squeezed out, so here we go! SPFBO is a rollercoaster of a journey, nail-biting when you know the expected date of your book’s first review, and tense every time you see a post if not, but it is a competition that not only brings great books to more readers, but brings together a community. It’s that part of it that I love the most, and so here we are with the three books that I want to highlight. Not only is Revenant Winds a joy to look at (how glorious is that cover?) it was also a joy to read. I beta read this book before it came out and even then in its not fully polished state it was a page turner. It follows the interconnected stories of Niklaus (jaded and snarky just the way I like them), Aldric (the nice one really trying to do his best) and Kurio (mysterious and awesome) and while it takes some time for them all to come together, that set up is well worth it when it does. My very favourite thing about this book however, is how skilfully magic is described. It reads a bit like a video game or movie where even I, non-visual that I am, could almost see and hear the crackling power of the raw magic. And there is a lot of magic and each time its used it feels fresh and different from the last time. I highly recommend this book, especially to all those who like some sword and sorcery in their reading. Siblings Thomas and Mia find themselves fleeing across a desolate land, hounded by the monstrous sand-hog, a steam-powered war machine bent on recapturing them at all costs. While I have not yet read THIS book, I have read a number of Ashley Capes’ other books (1-5 in the Books of Never, and The Fairy Wren) and so have no trouble at all suggesting people give this one a read. Ashley Capes writes adventures with an Indiana Jones feel to them, and there is always something going on. They don’t drag, but move at an easy pace and with just the right amount of poetry in their soul to capture the imagination. The Books of Never are a rollicking series of adventures that follow the eponymous Never and his gaggle of friends on a journey to discover the truth of Never’s past, and having enjoyed it as much as I did, this one has landed squarely on the TBR pile. Ash is also one of the few other contestants I’ve actually met in person and he is right up there on my list of good people to be stuck sitting next to at an all day convention, too. Prince Sargan is the worst swordsman in all Zraemia. His clumsy performance draws scorn from his uncle, pity from his sister, disappointment from his father, and sniggers from everyone else. But soon, Sargan will enter the temple and begin his long-awaited path to the seat of high priest. His brother will one day inherit the throne. His sister will marry. The enemy king will leave them alone. And all will be right with the world. Unless… the gods change the game. And when the gods play, the game turns to war – the Great War. Ancient prophecies surface, dark enemies rise, new allies emerge, old ones can’t be trusted, magic scorches the earth, reluctant heroes are made, and nothing is ever the same again. This book earned the place of the book SPFBO most made me want to read. I had heard of it before because my editor worked on this book as well, but it was this bit in the early review by Adam Weller over at Fantasy Book Review that made me want to read it. DUCK FARMING! To be able to build such a detailed world that duck farming can have a place alongside the action sounds absolutely delightful and I’m really really looking forward to reading this one. And there we go! 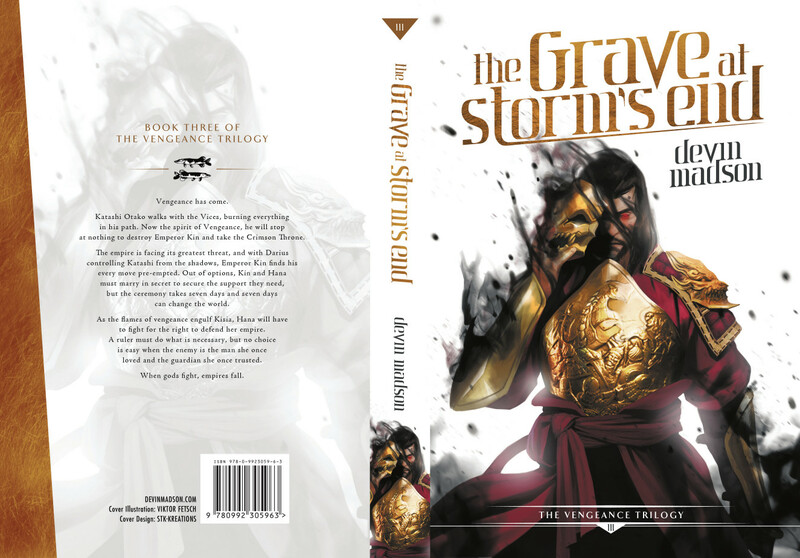 Three books I recommend from the SPFBO pool, though there are so many good books it is hardly enough to do justice to the talent on offer. 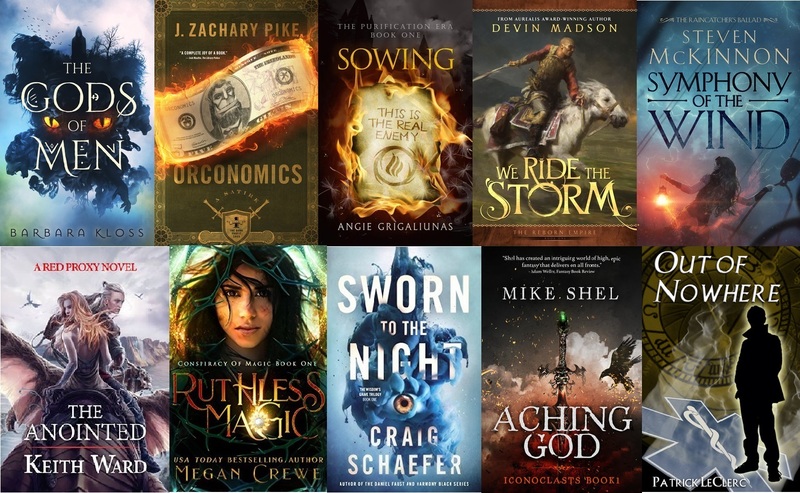 I am second last in our series of posts about our favourite SPFBO books, so stay tuned to read Mike Shel’s thoughts tomorrow (now HERE), or head back and check out Barbara Kloss’s post from yesterday, HERE! I have super duper exciting news! As you can surely tell from the headline of my cleverly-titled post, I am rebranding my first three books to bring them into line with the print quality of the recent series. HURRAH! Now the art on The Vengeance Trilogy covers won’t be changing, they will still feature the beautiful original artwork of Viktor Fetsch representing three characters from the books (Katashi Otako, Malice and Emperor Kin) but Shawn King from STK Kreations has given them fresh life. This is a project we’ve been working on slowly for quite some time now, since it became apparent that the original versions just wouldn’t hold up against the new ones. 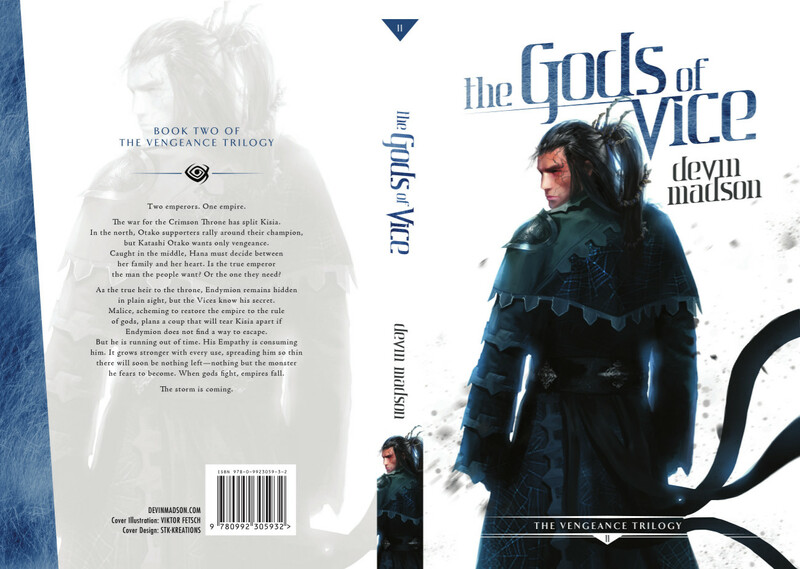 As you can see from the images above, the colour at the bottom of each covered too much of the art, especially on The Gods of Vice where the addition of the blue stole much of the detail from Malice. The spines, too, were very flat and overall lacking the punch Shawn has brought to The Reborn Empire and In Shadows We Fall. So it was time for a makeover! Aren’t they beautiful? I am super pleased with how these turned out and owe huge thanks to Shawn for taking the time with them that he did. The ebooks will be switching over in the next couple of days, but there is no difference to the interior so that’s all good. The original covers will be available in print through all the usual online retailers for about another two weeks or so for anyone who is still desirous of completing a set they might only be halfway through reading/purchasing, but after that we will be making the full switch over and they won’t be available anymore. That will leave the 150 or so sets of original print run books I have (with spot gloss and everything!) the last of their kind and once they are gone I will be shifting over completely to selling only the new ones at conventions as well as online. So that’s that! NEW COVERS! EXCITEMENT! There will of course be more cover excitement soon with Book 2 of The Reborn Empire, but until then this is here to tide you all over. Book! Look, it’s a book! I should try for something more professional than the impulsive squeeing that is going on inside my head, so here we go. It is with great pride, excitement and trepidation that I announce the arrival of We Ride the Storm, the first instalment in my new series The Reborn Empire. 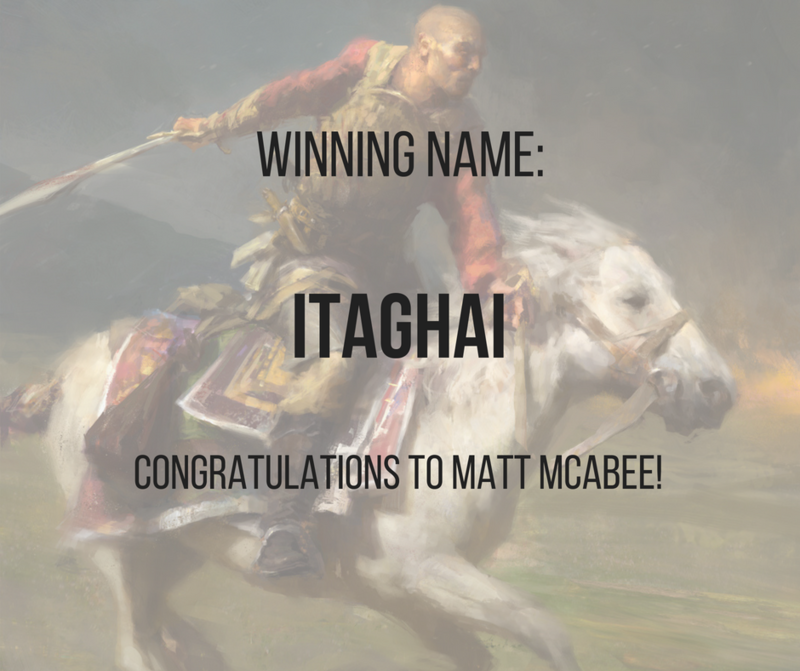 For those who have visited The Imperial Expanse of Kisia before in The Vengeance Trilogy or In Shadows We Fall, there will be some familiar ground and characters, and for those who have not they will make you welcome with open, if blood-stained, arms. I had wanted to tell this story ever since I finished working on The Vengeance Trilogy, because I knew, just KNEW, the direction the world was heading at the end of that series was going to get… interesting (read: bad). I wanted to see the fallout, to explore how small decisions could have big consequences, how kept secrets could fester, and how a world on the brink of social change could either bend or break when force was finally applied. And if it breaks, what will rise from its ashes? I had no great plan going in, I never do. I knew who I wanted to write about and had a vague sense of their character arcs, and from this vague miasma came a story darker even than I had expected (with promise of still more pain to come) and yet owning more humour and humanity than I had thought possible. And there is still so much journey left to take you on. Rah, Miko, and Cassandra still have a long way to go. We Ride the Storm will be followed in March 2019 by We Lie with Death, which will feature the delightful (read: cold, snarky killer) Cassandra on the cover, a picture I just CANNOT WAIT to see. She is a fascinating character and I am sure John Anthony will do her justice with his fantastic work. We Sing for Blood and We Dream of Gods will follow and conclude the series in March 2020 and March 2021 respectively, though there is always a chance the timing will be brought forward if everything goes well. And there is already a portion of my brain busily working away on what happens after the end of THIS story and how that moves even further into the rest of my world, so there’s plenty more to come. We Ride the Storm is now available worldwide in ebook and paperback (it makes a very pretty paperback), from wherever you most like to get your books. While it’s easy to get on Amazon and Book Depository etc, if you prefer to shop at a local bookstore you can always ask for it to be ordered in. Prefer to get your books from the library? Why not request your local branch gets a copy? Then it will be available for lots of other people to read and enjoy. 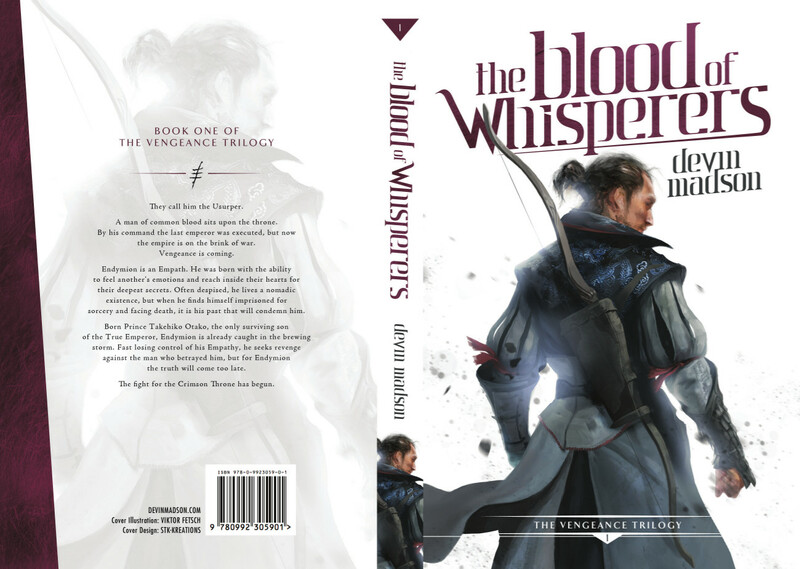 And of course if you read and enjoy then please do consider leaving a review, either where you purchased it or on Goodreads, and just generally shouting at all your fantasy-reading friends about it. Indie books (all books really) live and die by reviews, so even if it’s just a single line and a rating it is much MUCH appreciated. Ok, now the whole formal promotional thing is done, I can run around squeeing, yeah? And get back to working on the next one of course. 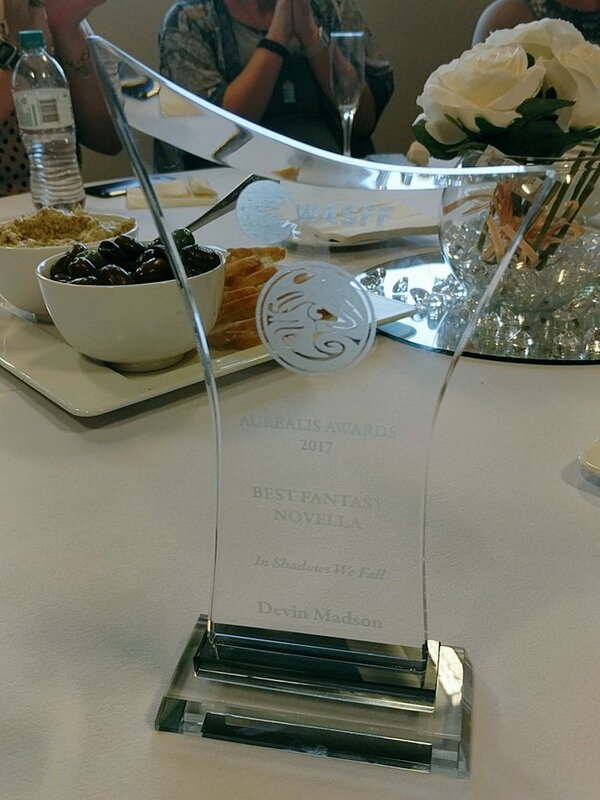 It has been almost a week since they read out my name and In Shadows We Fall as the winner of the 2017 Aurealis Award for Best Fantasy Novella and I probably ought to be used to the idea by now, but nope. For someone who can still occasionally be amazed at having kids eight years after the fact, it shouldn’t be a surprise that I’m still grinning to myself at random times. And I don’t think this is ever going to get old. I won a thing. And not just a competition, not just a popularity contest, a legit award judged by a panel of people who know what they are talking about. Someone other than me and my mum thinks my work is worth reading. WOW. Nope… not getting old. (I’m totally grinning right now, I bet you can feel the force of it through the screen. I’m grinning so much it’s bending REALITY). So, what’s next? I’m publishing the first book of a new series this year (more on that soon) and will be taking my first steps to shopping yet another new series to agents and publishers. I’m super excited about all of it and look forward to sharing the continuation of this journey with all of you. In the meantime if you’re interested in an e-copy of my Aurealis Award-winning (Sqqueeeee that will NEVER get old) novella, you can get one my signing up to my quarterly newsletter below. Unless there’s something very exciting going on you will only ever get four emails a year from me full of only the most awesome of awesomeness (still excited). Join the Devin Madson Quarterly! 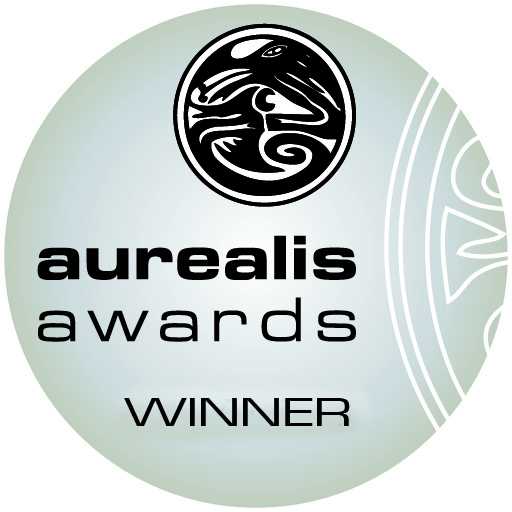 Grab a free copy of my Aurealis Award-winning novella ‘In Shadows We Fall’ (still not getting old…squeee!) when you sign up for my quarterly newsletter! Complete with news and updates and special short stories, it’s the best way to keep up with what I’m up to without getting bombarded with nonsense. Or spam. Ick. It is that time! Time for a final, full wrap-around cover reveal for the upcoming prequel novella IN SHADOWS WE FALL. The wonderful original art was done by the seriously talented John Anthony Di Giovanni, and the design and layout by the equally seriously talented Shawn King at STK-Kreations. IN SHADOWS WE FALL takes place sixteen years before the beginning of The Vengeance Trilogy and follows the events that led to the original downfall of the last Otako ruler, Emperor Lan. So without further ado… here is the cover of the upcoming novella IN SHADOWS WE FALL! I cannot describe how exciting it is to be getting this book out. I hope you all love the cover as much as I do! IN SHADOWS WE FALL, available for general release on the 16th of November 2017, or RIGHT NOW! (like seriously right now) if you sign up to my quarterly newsletter below. Once confirmed, you’ll get an email with a link to download the ebook in whatever form you like to read. Come for the book, stay for the newsletter! I mean it when I say quarterly, unless there is some EXTREMELY exciting news to share it will be no more than four emails a year (seriously, who has time for more? My job is writing books not emails!) Each email will contain updates and news as well as the occasional competition and piece of short fiction only for my subscribers.